It is true that I have two children under two. I either have a double pushchair with me, or one in a pushchair/on a trike and one in a sling. Having two is definitely harder than having one child, although I realise this more now when I only have one to look after. Having two is certainly not twice as hard as having one child though, and although I may seem to have my hand's full, I wouldn't change a thing. My days are busier and leaving the house takes that little bit longer. My days are also fuller and it is a rare occasion when the boys decide to nap at the same time. My days are however, full of more fun and excitement than ever. 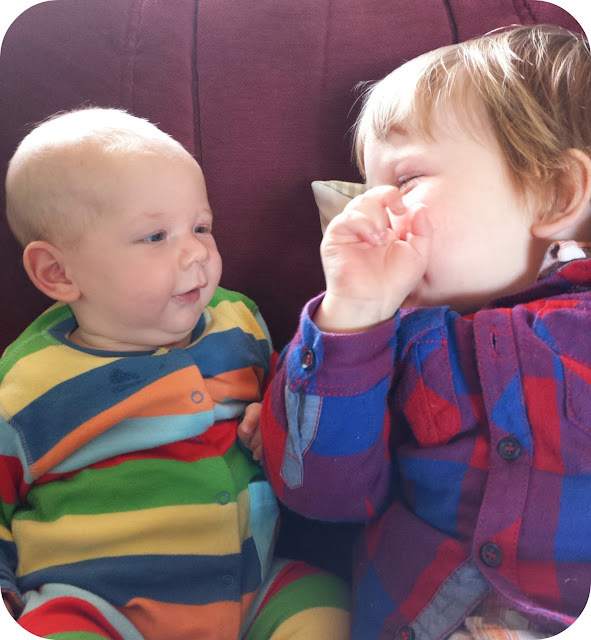 They are full of pride watching my gorgeous boys and any hard moments are completely worth it when I see the two little people that I created becoming friends. When I was pregnant I couldn't decide whether an 18 month age gap was crazy or clever. On the one hand I have two in nappies, two in a pushchair, two that are still dependant so much on me and two that need constant attention. On the other hand, Dylan has soon forgotten life without his brother in it and hasn't shown even a hint of jealousy. He has been given a playmate, a partner in crime. Someone to teach, to learn from, to fight with and to love. 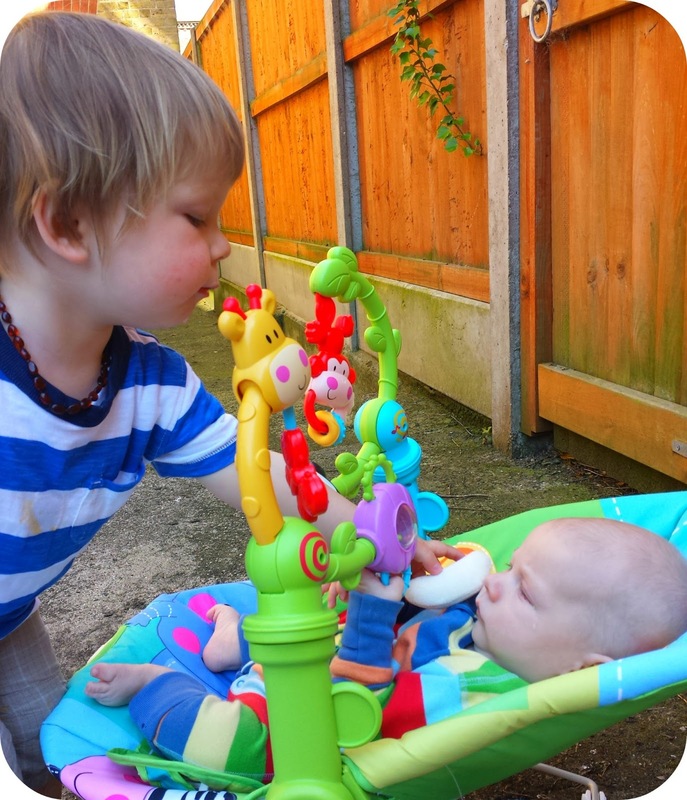 Archie has had a sidekick from the very beginning and the energy and effort I put into entertaining and stimulating Dylan as a baby is now a task shared as Dylan shows Archie toys, talks and sings to him and provides a constant show for his entertainment. Dylan is happier to have his nappy changed or sit in a pushchair with his brother besides him and some of our daily battles were eliminated by the newest member of the family's arrival. He is learning to share and already I can see how much he will love Archie being able to interact more. They already have their own little games and Archie cannot wait to be on the move and joining in with his big brother too. I may struggle sometimes with a child that wants to sit down and feed and another that wants to be pushed in the swings, but the furthur into our new adventure I go, the easier it gets to balance their needs. My hands are full right now, one hand to carry Archie and another to hold Dylan's hand. They have half of me each but they also have half of each other and we happy this way.. I love this post, its so true and it just gets better. Your hands are full now, but soon enough all they want is each other. Mummy's not allowed to join in the game because she's not little! exactly! It may not be twice the work but it is definitely twice the fun! Its a lovely post im close in age to my brother and we are so close. I've two boys with a similar age gap and I do find it a struggle at times but I wouldn't change it for the world. 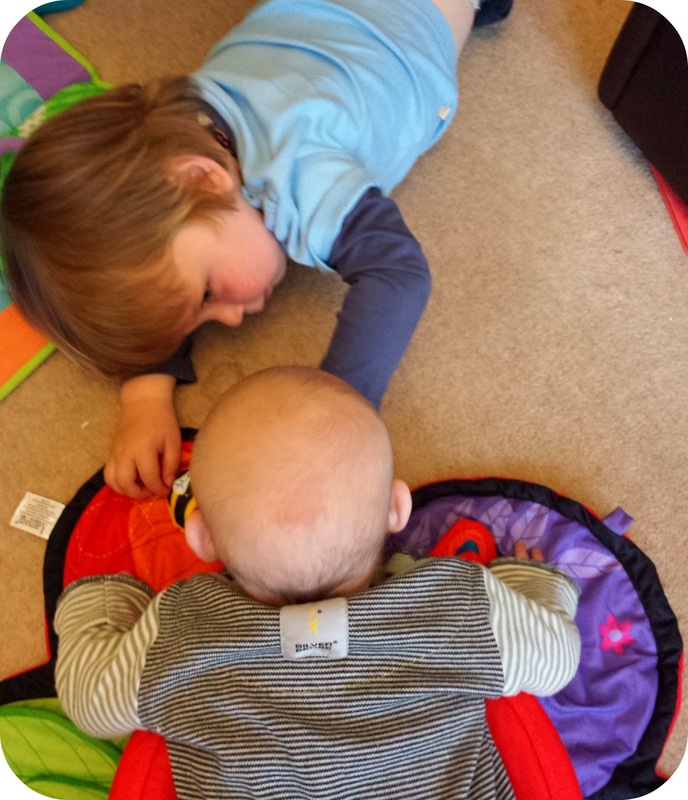 They are 4yrs and 2yrs old and are at the stage of enjoying each others company (with the occassional scuffle!) which eases the pressure a wee bit. I only have two, I do wonder what people say to parents of multiples or those with 3, 4 or more children! Lol- my most appreciated comment was "I couldn't have had twins". I can't believe how many people say it... or that they have it in their head it's something you can opt in or out of. Love this post, your boys are going to grow up with a playmate and that is lovely. Its great that they are so close already. It is more challenging having two but I wouldn't have it any other way. It is so rewarding too that is seems to balance out the challenging at the moment, I think it will be a whole new ball game once Archie is on the move though! Once I heard someone say about a big family that they heard the phrase "you've got your hands full" so much that the littlest one actually thought it was a way of greeting people or saying hello - as everyone seemed to greet them with it! found that so cute lol! I have the same gap as you, but I did it twice in a row so ended up with 3 in 3 years (so yes i get the comment quite a lot too!) It's a good gap, lovely for the children to grow up close in age and playing together. My mum had 3 in 3 years as well and she has survived just fair without a single grey hair as well! I watch 16 and counting and think that is the real meaning of 'hands full'! I have a 22mth age gap, sometimes I thought a 2yr age gap would be better- Seren's language was so much more developed. Today I had their first playschool photo. It's so wonderful to have them so close in age, yes the challenges are there but my children are the best of friends- and I got sleep deprivation out of the way with in one go!